International Women’s Day (IWD), originally called International Working Women’s Day. 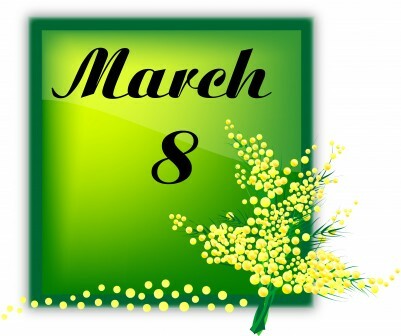 It is marked on March 8 every year. In different regions the focus of the celebrations ranges from general celebration of respect, appreciation and love towards women to a celebration for women’s economic, political and social achievements. Started as a Socialist political event, the holiday blended in the culture of many countries, primarily Eastern Europe, Russia, and the former Soviet bloc. In many regions, the day lost its political flavour, and became simply an occasion for men to express their love for women in a way somewhat similar to a mixture of Mother’s Day and St Valentine’s Day. In other regions, however, the original political and human rights theme designated by the United Nations runs strong, and political and social awareness of the struggles of women worldwide are brought out and examined in a hopeful manner. via International Women’s Day – Wikipedia, the free encyclopedia. The following comments are said to have come from Andy Rooney, but no one is really sure: They are sooooo very true, I wanted to share them with this blog. Women should be honored for, if nothing else, their attitude ! A woman over 40 knows herself well enough to be assured in who she is, what she is, what she wants and from whom. Few women past the age of 40 give a hoot what you might think about her or what she’s doing. Yes, we praise women over 40 for a multitude of reasons. Unfortunately, it’s not reciprocal. For every stunning, smart, well-coiffed hot woman of 40+, there is a bald, paunchy relic in yellow pants making a fool of himself with some 22-year-old waitress. You’re right, it is very ironic that we don’t have WD here. No, it’s more sad and disgusting, actually. Sometimes lately I feel very disillusioned about our country. The politicians are only out for their own pocketbooks and those of their friends who give kickbacks, and too many of our citizens are too blind to see what’s really going on in Washington. Blind or they just don’t pay enough attention. They get all their their information from radio personalities who are blatantly biased and dishonest, instead of learning for themselves what they need to know.